Sega taps the always lucrative computer-animated film tie-in market with Planet 51, the story of an astronaut who becomes the alien invader on a planet of little green men. 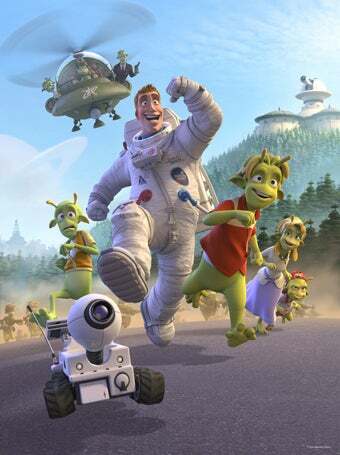 Planet 51's premise is simply brilliant. Captain Charles "Chuck" Baker lands on a supposedly uninhabited planet, only to discover the world is populated by little green men, living in an idealistic society reminiscent of 1950's America, whose only fear is being overrun by alien invaders. It's a neat little twist on the alien comedy by the writer of Shrek and Shrek 2, so by all means it should be highly entertaining. The game, however, sounds a bit less exciting. Developed through a partnership between Sega, Pyro Studios, and Ilion Animation Studios, Planet 51 the game is described as a mission-based driving game for the Xbox 360, PlayStation 3, Wii, and DS. Mission-based driving? Perhaps I just can't see the appeal yet. I'll reserve judgment until we get closer to the game's Winter 2009 release.